A good server administrator looks out for new vulnerabilities. When you run a server with ports open to the public, you should obsess over its security. Unfortunately, even if you keep up with all the latest security patches for your applications and operating system, your server could still be vulnerable to zero-day attacks: attacks targeting unknown vulnerabilities that don't have any patches. AppArmor is a Linux kernel module that acts as an access control system that protects your server from such attacks. This module has been available on Ubuntu by default ever since Ubuntu 8.04 was released. When AppArmor is active for an application, the operating system allows the application to access only those files and folders that are mentioned in its security profile. Thus, with a well planned security profile, even if the application is compromised during an attack, it won't be able to do much harm. In this tutorial, we will create a simple AppArmor security profile, which is a text file containing permission details for Nginx, a popular HTTP server. For the sake of demonstrating how AppArmor works, we will configure Nginx to serve static files from two directories: /data/www/safe and /data/www/unsafe, and configure AppArmor to confine Nginx to /data/www/safe. With this setup, when AppArmor is inactive, an external user will be able to access files from both directories. When AppArmor is active, the user will be able to access only the files in /data/www/safe. Your Nginx server is now operational. The default server will be running on port 80. You can test it in a browser by visiting your Droplet's IP address as the URL: http://<server-IP>:80. 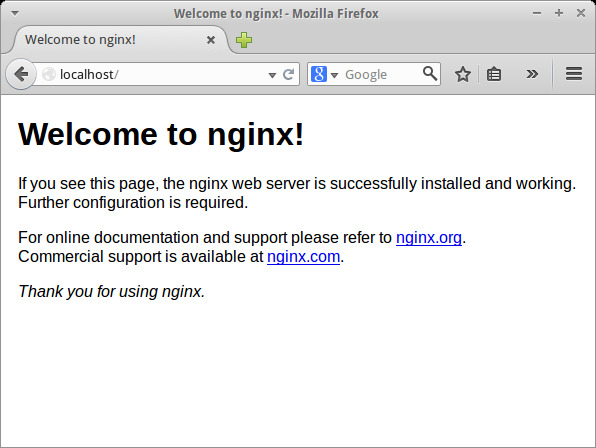 You should see the default Nginx welcome page. Create the directories from which the static files will be served. The Nginx configuration is now complete. You should see quite a few profiles. Some will be in enforce mode, and some in complain mode. When an application's profile is in complain mode, AppArmor logs the activities of the application without restricting it in any manner. Once there's something to log, you'll find the log files for the Nginx server in the /var/log/nginx directory. AppArmor restricts what an application can do only when its profile is in enforce mode. You will also notice that there is no profile present for the Nginx server. We'll create one in the next step. Install apparmor-utils. These are a collection of utilities that help you manage AppArmor. You are now ready to start profiling the activities of Nginx. Use the aa-autodep command to create a new blank profile. The profile will be created in /etc/apparmor.d. Once the profile is created, use aa-complain to put the profile in complain mode. Open a browser, and visit http://<server-IP>:8080/safe/index.html. 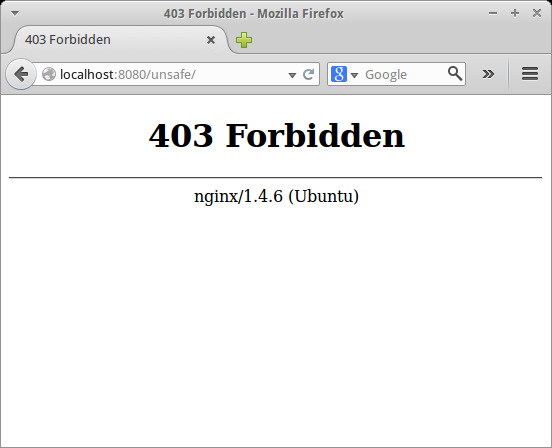 This will trigger the normal entries for accessing the safe website to appear in your Nginx logs. Go back to the terminal. Now we'll use an AppArmor utility to go through the Nginx logs and approve or disapprove each action it finds there. This command scans the log files and updates the AppArmor Nginx profile. You will be prompted several times to allow or deny a capability. Assuming your server is not under an attack currently, you can press A every time, since all the capabilities requested are necessary for Nginx to work correctly. Finally, when prompted to save the changes, press S.
For Nginx specifically, you will need to make some changes to the auto-generated file for it to work properly. Open the /etc/apparmor.d/usr.sbin.nginx file for editing. The apache2-common include lets Nginx listen on various ports. The new capability lines allow Nginx to start new processes. The deny rule allows us to block Nginx from accessing the /data/www/unsafe/ directory. Your profile might look a bit different, since it was generated based on your log file. It's up to you whether you would rather research and update individual parameters, or copy this file wholesale, with the usual caveats about considering your own server environment. AppArmor permissions can be tricky to get right, so you can use this example file and your auto-generated ones as starting points, but be prepared to do some troubleshooting. The AppArmor Nginx profile is ready. Use the aa-enforce to put the profile in enforce mode. If you run into errors at any of these stages, read the errors, double-check your configuration files, and check /var/log/syslog to point you in the right direction. You should see Nginx processes running in enforce mode. 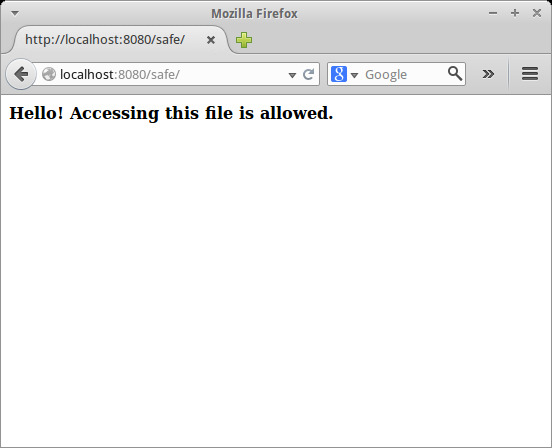 Go back to the browser and visit http://<server-IP>:8080/safe/index.html. You should be able to see the page. Then visit http://<server-IP>:8080/unsafe/index.html. You should see an error page like the one shown below. This proves that our profile is working as expected. You will then have to modify your profile based on those errors. In a real-world scenario, arriving at a useful AppArmor profile for a new application involves much trial and error, and is quite time-consuming as well. With this tutorial, you have learned to create an AppArmor profile from scratch. In a real life scenario, you would want to follow a more rigorous process before enabling AppArmor for a large application. First, enable complain mode with the aa-complain command. Then, system administrators usually wait for several days before running the aa-logprof command to give the system time to log more common actions for the application. It is recommended that you do the same if you are going to create a profile that will be used in production systems.